After a photograph is captured with the iPhone, there are many ways to share the image with others via social share or cloud storage. While, it’s a very digital world now for photos, there is still a need to be able to print the photos too. Most people will sync their iPhone photo library to a computers which can then print, but that can be a limited line of thinking when the iPhone allows so much mobility. I have covered a couple printers in the past that I have and use regularly. Along with physical mobile printing options, there are also online printing services available to use with the need of a computer. Everyone knows to think through both price and portability of the printing solution. First on my list though is the resulting image print. What the prints will be used for will impact the final choice. A: The wireless CP900 from Canon. The prints are the size of a postcard, with the option to print full bleed or with a boarder. The paper is either Canon Branded back or with a mailing postcard marking (text area, address area and stamp box). Printing involves the paper automatically passing through the printer 4 times to layer the colors and protective surface on. B and B: Two examples of printing through the LG PD233. It is the most portable printer being barely larger than the iPhone, using bluetooth, and the ZINK active paper. Kids love being able to have a little print right away from something that fits in a pocket (takes about a minute). QR barcode can automatically be added if the image is also uploaded to a social share service. C: Just for reference, a real Polaroid print from a OneTouch Land Camera. D: Printic service printed. The service charges less than a dollar per print uploaded from the iPhone, the service prints and mails in a nice envelope. Text can be added to the photo via the app too. The quality is very nice, but it isn’t instant gratification. E: StickyGram is an online printing service. This is an example of their Instagram magnets (9 different per sheet). It can be accessed via the iPhone browser. 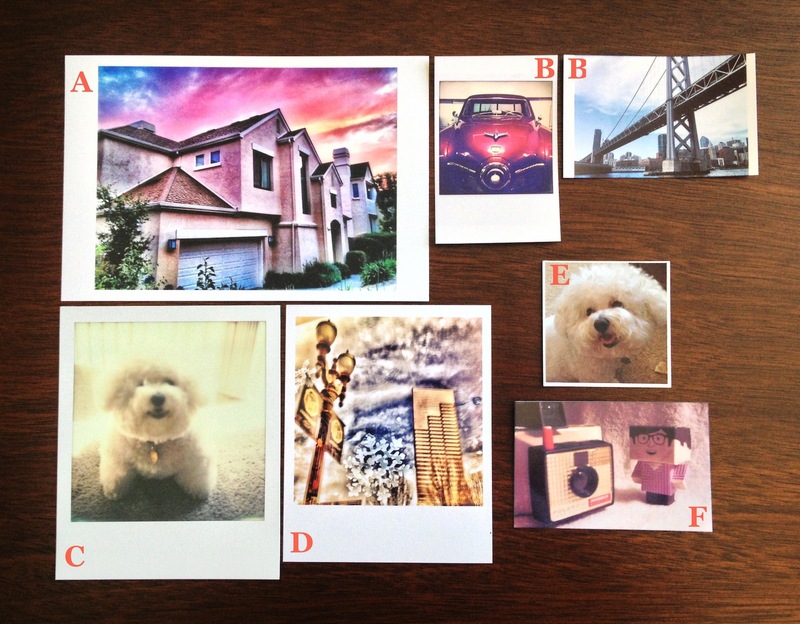 The magnets are only one of the many printings that are offered using a person’s Instagram photos. F: Another ‘for example’, this is an print from the current Polaroid camera, like the Canon uses Zink paper. G: Not shown, Prinstagram has an iPhone app (called Print Studio) to select the print size and format (small/large cards and small/large photo books) and photos. They offer as many print sizes and formats as there is examples above. Again, not for instant gratification but provides a nice quality product.